Pope Francis is making his first visit to the United States this week. The nations' attention is captivated by the number of touchy political and social issues he plans to address, but those living the Northeast megalopolis between Washington D.C. and New York are especially engaged when it comes to one particular element of the pope's trip: his route. What the New York Times deemed the "knotty logistics" of Francis' visit have elicited a powerful NIMBY (Not In My Backyard) reaction; one that in some cases has come to usurp the pope's message. Yes, Pope Francis will address a joint Congress in D.C. and visit the 9/11 Memorial in New York, but how on earth will he get to these places? And how will it impact me? Nimbyism is typically associated with issues of real estate, in which residents of a certain developmental proposal reject having it placed nearby while acknowledging that the development is necessary—somewhere else. While this may be a rational inclination for homeowners, it is also a costly one for society-at-large. Several of the places the pope will visit during his trip, including a prison in Philadelphia and Catholic Charities, a social services organization in D.C., fall under this umbrella of problematic development. As far back as August 5th, the Pennsylvania governor's office released an outline of plans to help manage transportation needs during the pope's visit. The Washington Post has published a number of articles regarding how to get around during Francis' stay. The bottom line: in a city already backed-up with traffic woes, avoid driving at all costs. New Yorkers are accustomed to unexpected delays along their commutes, but anecdotal evidence suggests that even long-time residents of the city are fretting the anticipated delays. After all, the pope and President Obama will be at the U.N. General Assembly, "a mammoth, traffic-snarling security circus in its own right" as the New York Times puts it. 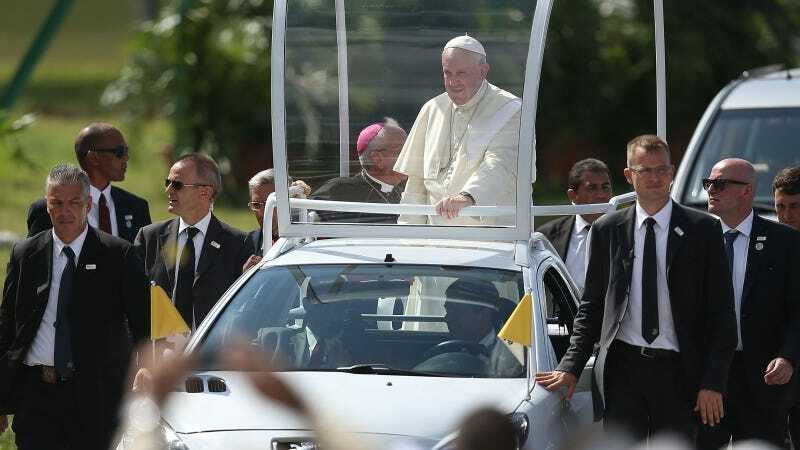 The pope is making this taxing trip to address global issues of the broadest relevance and farthest reach. Environmental stewardship, poverty, human rights—these are the things he wants to talk about. And these are the things it's hard to get people to care about from afar. They are the most personal issues when confronted directly with them, but easily forgotten when obscured by time or distance. It is also much easier to make conversation about the disruption to daily life that the trip will cause than the overarching themes that bring the pope to America, let alone the uncomfortable undertones. Pope Francis has never been to the United States before—in his entire life—in part because he is known to view America as having an over-sized impression of its place in the world. He is a Latin American critical of the United States’ economic and political hegemony, a Jesuit of Italian ancestry who looks more to Europe than to North America, a Spanish speaker who is not all that comfortable speaking English, and a pastor who disdains “airport bishops” — his term for prelates who spend more time jetting around the globe than serving in their dioceses. The pope holds many viewpoints that make a large swath of Americans uncomfortable, not least of all a strong conviction in the reality and significance of climate change. Admittedly, the visit is causing serious delays that will disrupt people's painstakingly calculated lives for a significant interval. Even some major highways and bridges are closing. In the long run, climate change will also cause major infrastructure damage (and delays) through sea level rise, flooding, drought, and intense storms, and the delays from this damage will take more than a few days to resolve. A more equitable society could lead to improved transportation infrastructure for us all. Maybe even a high-speed train in the Northeast corridor. But these are not so much NIMBY issues, until they are. Environmental issues are often easily distilled through a lens of nimbyism, which makes sense as the word 'environment' can also simply mean surroundings. New Yorkers are vehemently against fracking because it is happening literally on their property, in their yards. The Cape Wind project, a decade-long attempt to build the first offshore wind farm in the U.S., became fatally bogged down in part due to the impact it would have on coastal residents' views around Cape Cod. Californians are experiencing an epic drought, and (coincidentally?) finally taking water conservation seriously. Some people don't like solar panels because they consider them neighborhood eyesores. The pope's visit is an issue of national security, and all necessary precautions must be taken. But in the years ahead, when reflecting on this moment in history, will the local impacts or the lasting message have made a bigger impression?